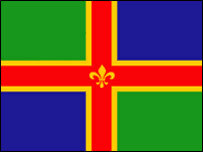 A chartered surveyor is hoping to erect Lincolnshire's new flag at the North Pole in an expedition this April. Andrew Pearce, 42, is one of a team of six taking the 70 mile (112.65 km) journey over a nine to 10 day period in temperatures as low as -31F (-35c). He got the idea of putting the flag on the Pole from his wife Catherine, 39. Mr Pearce said: "She's born and bred Lincolnshire, I work and obviously live in Lincolnshire and we thought we'd put Lincolnshire on the map." 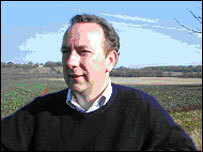 The 42-year-old, who works for Humberts surveyors in Lincoln, said not as many people travelled to the North Pole as to the Antarctic. "The difference between the two poles is that the North Pole is more technical, in that you've got more obstacles to negotiate - it's more challenging - mentally as well as physically," he said. His team will be led by Nottinghamshire-based explorer Mike Thornewill, whose company Polar Challenge International is organising the trip. 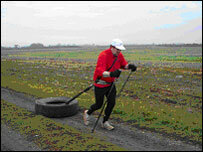 The explorers' physical aptitude for the task was tested by dragging an old lorry tyre along a farm track for about a mile within a given time. And Mr Pearce's training for the expedition has involved pulling a 9 st 4 Ibs (60 kilo) tyre with a make-shift harness made of his wife's riding equipment in his home village of Fulbeck. He has also been cycling and running. Apart from sub-zero temperatures exacerbated by the wind-chill factor, the explorers must drag their sledges over pressure ridges (created by the collision of ice plates) which can be as high as 20 ft (6m 9cm) and use a boat to negotiate strips of water known as "leads". Polar bears can also pose a threat, but can be scared off by means of flares, ski poles and rifles. "You don't often find them [polar bears] that far north but people have seen them up there, and with global warming their prey is getting scarcer," said Mr Pearce. "If they're that far north and there's less prey around they're going to be hungry - and we're on the menu, so to speak." When Mr Pearce reaches the North Pole there will not be any flags there already marking the spot. "The South Pole has a permanent marker because it's on a landmass - a continent. But the North Pole is a constantly moving environment so you won't be putting the flag on the same bit of ice twice." Mr Pearce, who has met the costs of his trip using his own funds, is aiming to raise £20,000 for Macmillan Cancer Relief and the Lincolnshire and Nottinghamshire Air Ambulance.